This year, for the first time ever, the first week in August will mark World Breastfeeding Week. Backed by Unicef, the World Health Organization, and the International Baby Food Action Network, World Breastfeeding Week is designed to raise awareness about the benefits of breastfeeding. In particular, the theme of World Breastfeeding Week is to draw attention to how breastfeeding supports to sustainable living. Design your own silicone wristbands to show your support. During the first week in August, World Breastfeeding Week will be aimed at many things, including how to engage a wider range of advocates and supporters. One way to help draw attention to World Breastfeeding Week is to create customized silicone wristbands. 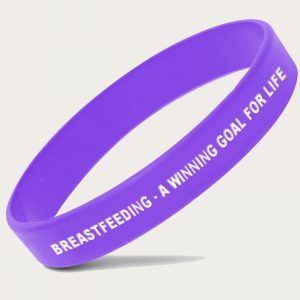 Because the colors of World Breastfeeding Week are swirled rainbow, the wristbands can be designed to mimic that look, and they can include sayings such as "Value well-being from the start" or "Breastfeeding is key to sustainable development" or "Breastfeeding - A Winning Goal For Life". In 2015, world leaders developed 17 Sustainable Development Goals to help end poverty, protect the environment, and ensure prosperity. World Breastfeeding Week connects the act of a mother breastfeeding to how those goals can become reality. For example, according to WorldBreastfeedingWeek.org, breastfeeding creates less waste than formula feeding, which translates to less pollution affecting oceans and marine life. Furthermore, the organizers point out that breastfeeding is a natural way to feed infants and babies without putting extra burden on a family’s food expenses. The more unique you make your World Breastfeeding Week wristbands, the more popular they will become. Use our easy online tool to design your custom bracelets. At Amazing Wristbands, we offer 100% latex-free wristbands, and all of our silicone products are non-allergenic. We offer free shipping, free artwork, free design, and free color matching. There are no minimum order requirements on our most popular wristband styles, and your custom bands will ship within 5-10 days. Build your own World Breastfeeding Week wristbands online today!